Past articles have discussed how to evaluate the need for rescue N applications for corn after excessive rainfall. A recent study completed at the Marshfield Ag Reserach Station on a somewhat poorly drained soil can help when deciding how much rescue N to apply. 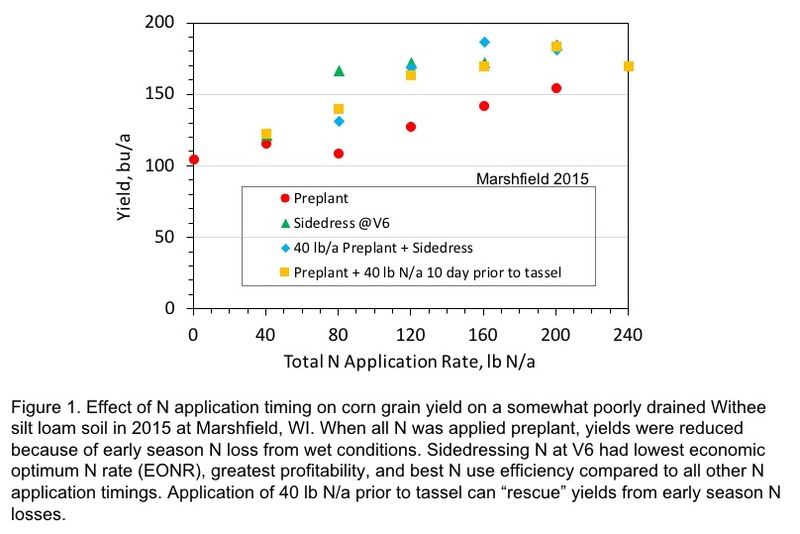 Where wet conditions caused loss of preplant applied N at Marshfield, 40 lb N/a applied 7-10 days prior to tasseling was adequate to compensate for N loss (Figure 1). Sidedressing all of the N was more profitable than preplant or split applications. When trying to decide on a rescue N application rate, consider your cost of production and remember that the first 30 to 50 lb N/a will provide the greatest return on investment.